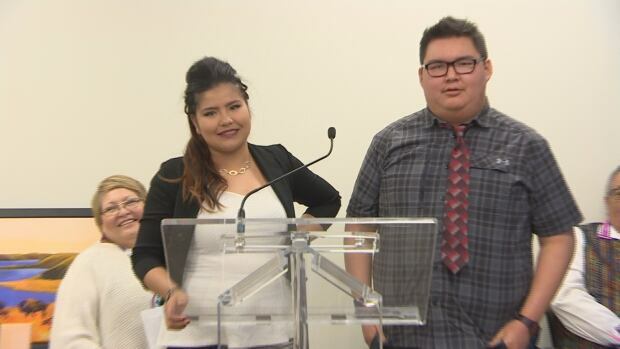 A new art piece will be on display at the Allan Blair Cancer Centre in Regina, courtesy of high school students from the Ochapowace First Nation. On Tuesday, a three-panel canvas piece was unveiled which was painted by the students. It depicts a scene featuring several buffaloes — an animal that symbolizes strength and courage — and includes a white buffalo, which is especially rare. The aim of the art is to bring hope to cancer patients. The buffalo was the idea of artist and elder Michael Lonechild, who guided the students who worked on the painting, said Tristan Isaac, one of the students who helped create the piece.